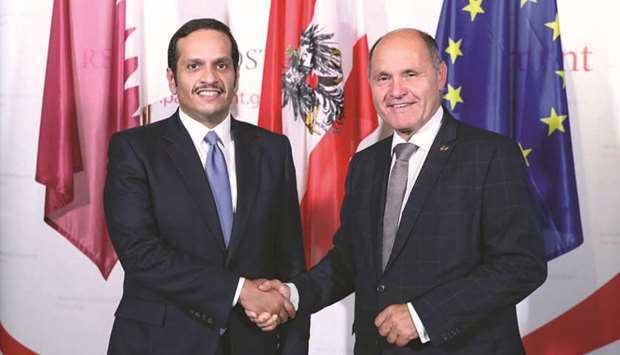 HE the Deputy Prime Minister and Minister of Foreign Affairs Sheikh Mohammed bin Abdulrahman al-Thani shakes hands with President of the Austrian Parliament Wolfgang Sobotka. HE the Deputy Prime Minister and Minister of Foreign Affairs Sheikh Mohammed bin Abdulrahman al-Thani, who is currently visiting Austria, met yesterday with executive director of the United Nations Office on Drugs and Crime (UNODC) Yury Fedotov. 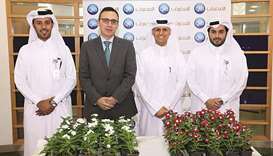 During the meeting, they discussed means to cement co-operation between Qatar and UNODC. HE the Deputy Prime Minister and Minister of Foreign Affairs Sheikh Mohammed bin Abdulrahman al-Thani during a meeting with Austrian Minister for Europe, Integration and Foreign Affairs Karin Kneissl. The Deputy Prime Minister and Minister of Foreign Affairs referred to the Doha Declaration, which was the most important outcome of the 13th United Nations Congress on Crime Prevention and Criminal Justice and its emphasis on the participants’ commitment to uphold the rule of law and to prevent and combat crime in all its forms and manifestations at the local and international levels in addition to work to activate criminal justice systems, as well as providing access to justice for all. HE the Deputy Prime Minister and Minister of Foreign Affairs Sheikh Mohammed bin Abdulrahman al-Thani holds talks with UNODC executive director Yury Fedotov. The Deputy Prime Minister and Minister of Foreign Affairs also met with Austrian Minister for Europe, Integration and Foreign Affairs Karin Kneissl. They discussed bilateral relations and ways of strengthening and developing them, in addition to a number of topics of common concern. The Austrian minister affirmed the convergence of views on a number of issues that have been put forward. 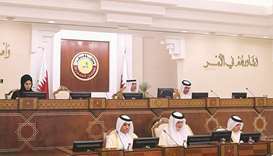 Regarding developments in Syria, he stressed that Qatar is closely monitoring the developments in Idlib, calling for the provision of international guarantees for the protection of civilians. The Deputy Prime Minister and Minister of Foreign Affairs also met yesterday with President of the Austrian Parliament Wolfgang Sobotka. During the meeting, they discussed bilateral relations and means to promote and develop them, in addition to topics of mutual interest.